The elephant Minnie in October at the Big E in West Springfield, Massachusetts. 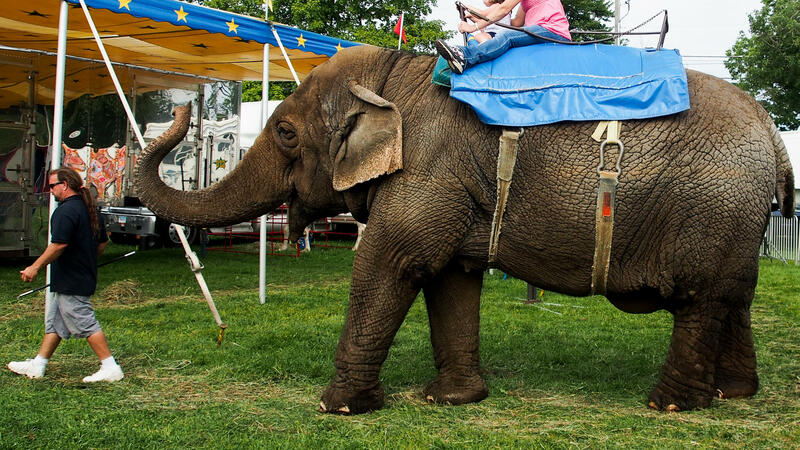 Over 1,200 people have signed an online petition to ban wild animal acts at the Big E.
Connecticut residents Jill Alibrandi of Redding, Michelle Catino of Stamford, and Lea Haut of Bridgeport, protest the elephant rides at the Goshen Fair. Tim Commerford leads his elephant Beulah and two customers at the Goshen Fair in Goshen, Connecticut, in August. 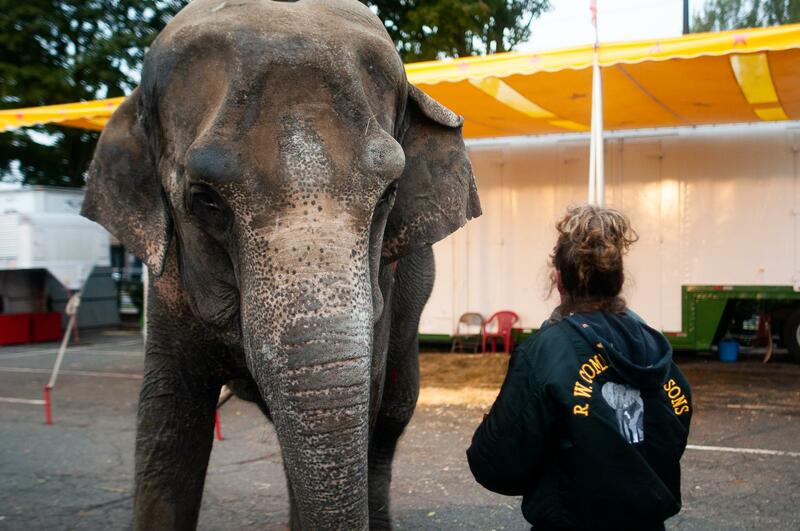 A Commerford employee stands next to the elephant Minnie at the Big E in October. 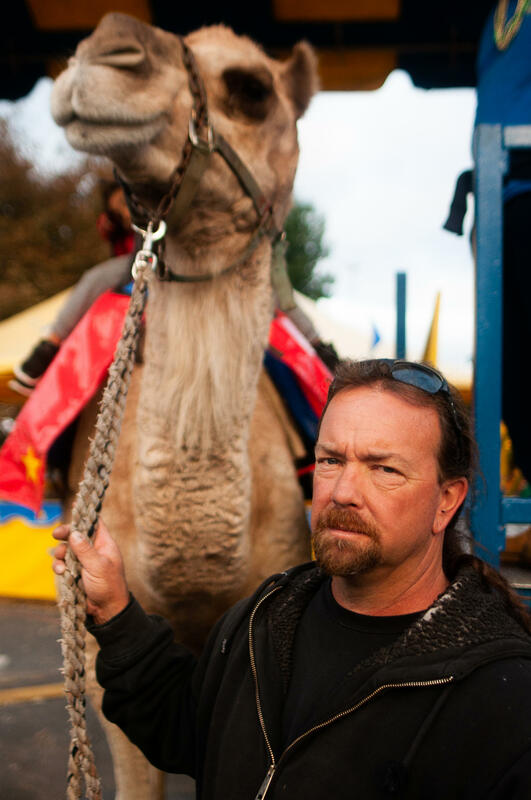 Tim Commerford with one of his camels at the Big E in October. Cassidy performs his duty with such gusto that even when he’s talking about the controversial elephant rides at his two-week-long, mega-fair, he’s prone to making off-the-cuff comments about poultry. Steven Wise also spends his time talking about animals, but he doesn’t view them the way Cassidy does. Wise is a lawyer who argues that some species — because of their intelligence and self-awareness — should no longer be treated as human property. When it comes to animal welfare and animal rights, Cassidy and Wise don’t just disagree about which lane to drive in. They’re on completely separate highways. And smack dab in the middle of both those highways stand three of the largest creatures on earth: elephants — two Asian and one African. Their names are Beulah, Karen and Minnie. The oldest, Beulah, is almost 50. She arrived in the U.S. at age two on the last boat to transport wild-captured elephants into the country. Wise and his organization, the Nonhuman Rights Project, want to send the elephants to a sanctuary in California. In order to do so, they would need to take the elephants from their legal owner, Tim Commerford, who’s based in Goshen, Connecticut. Commerford is used to protesters. They follow him to expositions and fairs across the Northeast, complaining about mistreatment of his many exotic animals, and citing the numerous USDA infractions he’s received, including a recent one about the unhealthy state of Beulah’s hooves. But Wise isn’t asking for better conditions for the elephants. He’s filed petitions in Connecticut seeking writs of habeas corpus for Beulah, Karen and Minnie. Wise also filed similar petitions in New York state on behalf of chimpanzees, and for an elephant at the Bronx Zoo. He wants them counted as “persons.” That’s a legal term that doesn’t apply solely to human beings. If successful, the designation would fundamentally change the animals’ status under the law. Wise has spent more than 30 years building a legal campaign, which he modeled after an 18th-century case that made slavery illegal in England. During a quick break from tending his camels at the Big E, Commerford commented on Wise’s allegations. Commerford also commented on Wise’s other habeas corpus petitions. Technically, Wise is failing. No judge has yet granted habeas rights to any of the animals Wise claims to represent. 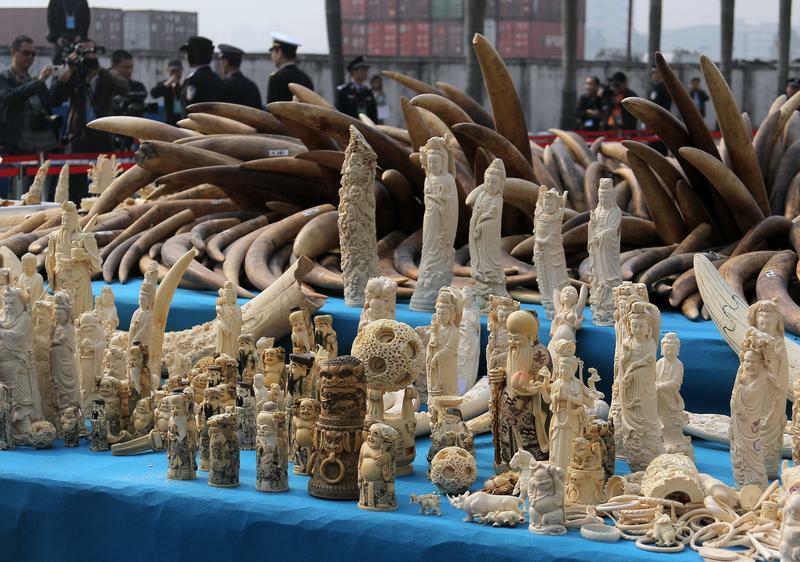 The Nonhuman Rights Project appealed the ruling. Wise said the petition isn’t frivolous: it’s “novel,” noting a recent legal opinion to prove his point. Back at the Big E last September, the tension was ramping up. A video of a Commerford employee roughly handling a camel went viral. Over 120,000 people signed an online petition to ban wild animal acts at the Big E.
The fair itself was crowded on a Friday night, but things were pretty quiet over at the elephant rides. Minnie, a 45-year-old Asian elephant, was munching some hay. According to USDA documents, Minnie has a history of injuring her handlers, but she seemed pretty subdued on this night. A vendor rolled an orange across the pavement to Minnie. She picked it up with her trunk and placed it in her mouth. A regular fair-goer named Kathy — she asked to use only her first name — stood with her young adult daughter and watched. “We were just remarking how it’s Friday night, and there’s absolutely nobody in line waiting to have elephant rides after all the stories and everything have hit the news,” Kathy said. Commerford denies business has taken a hit. The Big E’s Gene Cassidy said keeping elephants at the fair is essential to its identity, despite the protests. Wise and the Nonhuman Rights Project expect decisions from Connecticut judges in regard to Beulah, Karen and Minnie by early next year. Wise said they’ll also seek habeas corpus for a captive orca whale in the near future. Correction: An earlier version of this report inaccurately said Steven Wise and his organization want to send three elephants to a sanctuary in Tennessee. The sanctuary is in California. "I did a baptism once in Fort Worth, Texas. ... I came in on an elephant carrying the baby, which was four weeks old," the Rev. Jerry Hogan says. "Now that baby is 15. I've married a lot of these kids and I've baptized their kids, and watched them grow." It's late April at Baltimore's Royal Farms Arena, in the closing weeks of the Ringling Bros. and Barnum & Bailey's "Out of This World" tour. Circus sideshow displays of “freaks” were very popular in the United States up until the 20th century. 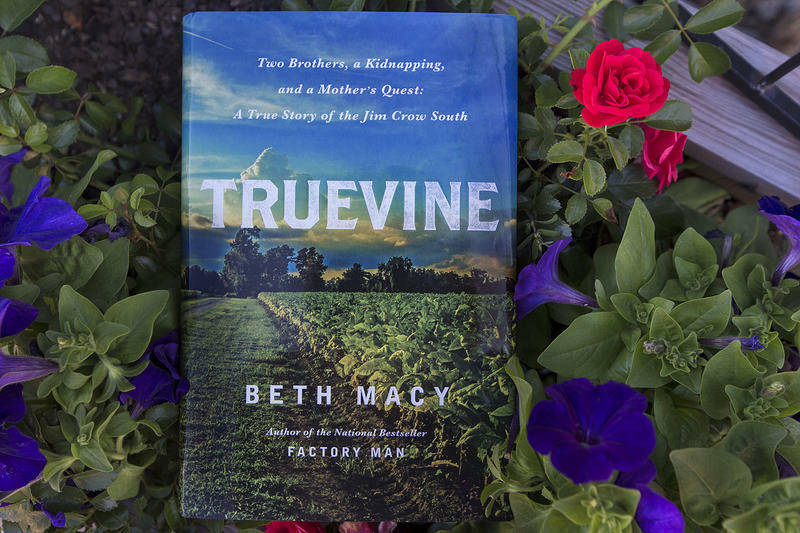 In 1899, George and Willie Muse, the African-American children of sharecroppers, were lured from their home to become part of one such sideshow.